We love that Acorn Media is releasing a new DVD that follows the foibles of an eccentric aristocrat (is there any other kind? ), his peculiar family, and the ramshackle ancestral home they share, P.G. Wodehouse’s Blandings, Series 1 made its North American DVD debut from Acorn on September 3. 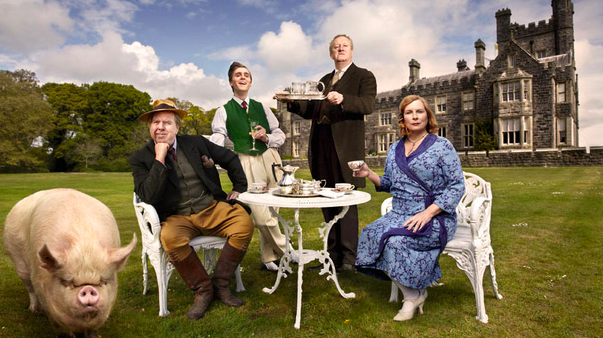 Having made its U.S. premiere on Acorn TV in July 2013, this new BBC series is the first television adaptation of the beloved Blandings Castle stories since the 1960s. Lit great Wodehouse’s madcap protagonists come to vivid life in this witty British series starring Timothy Spall (The King’s Speech, The Syndicate) and Jennifer Saunders (Absolutely Fabulous), as well as Mark Williams (Harry Potter) and Jack Farthing (Agatha Christie’s Poirot). Wodehouse, a perennially bestselling author and creator of the beloved Jeeves and Wooster, continues to gain new fans. The DVD 2-Disc set includes six episodes of the period comedy from the master of British wit is $39.99. What will you see? Clarence Emsworth may be the current master of Blandings Castle, but he’s hardly lord of the manor. All he wants is peace, quiet, and quality time with his prize pig, the Empress. But his run-down estate is perpetually filled with crazy characters demanding his attention, led by his imperious sister, Connie. Between her baleful stare, his son Freddie’s lack of brains, and a parade of visiting oddballs, Clarence is doing anything but living a tranquil country life. Only his loyal butler, Beach, seems to be on his side.